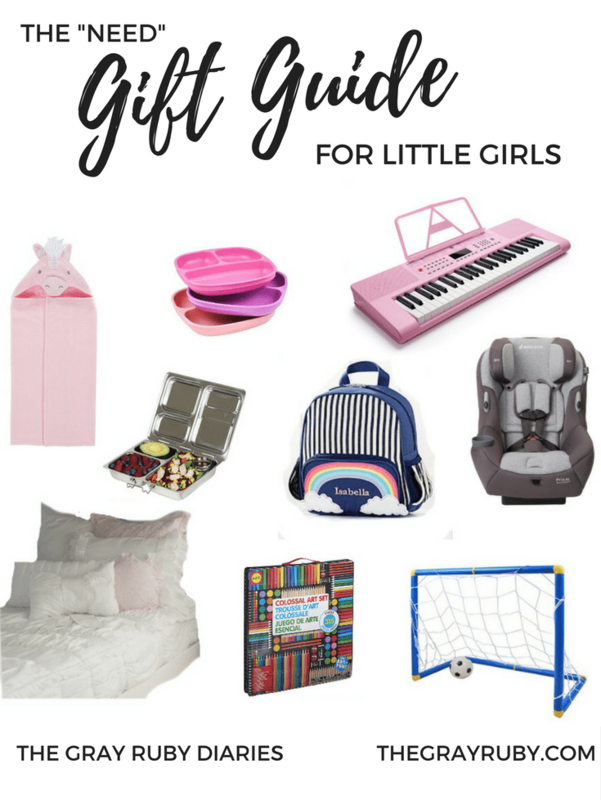 Every year I search and search for the perfect gift for my three little girls and every year I love sharing all the fun items I find with all of you. This year I am doing things a little different. I am breaking up my gift guide in 4 parts. In our house we have a rule in regards to how many gifts the girls get. We love spoiling our girls but we want their gifts to be meaningful and appreciated so we put this rule into place to help that happen. This has worked really well in the past and is incredibly helpful in keeping me organized when gift giving. 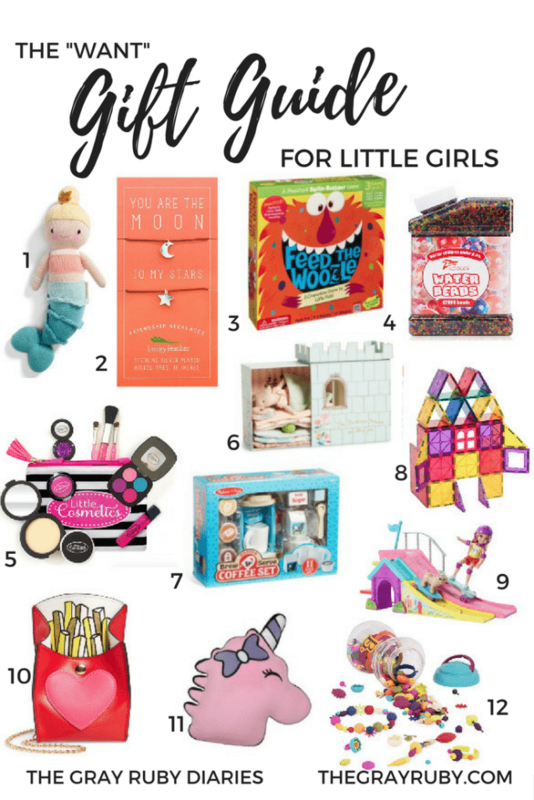 So this year I am splitting up my gift guides into WANT, NEED, WEAR, READ and a gift guide called “SANTA” for my santa’s gifts of years past (plus this year which might be my best year yet). 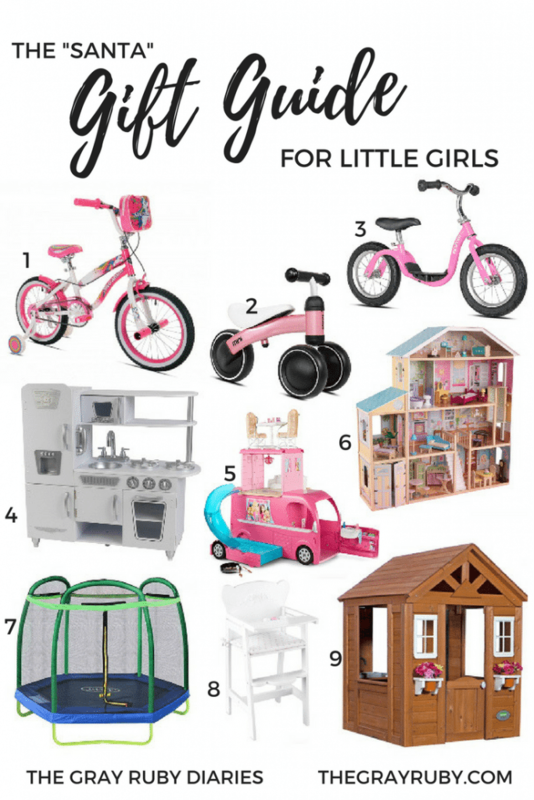 I hope this helps you when deciding what to get your little girl this year. Cuddle + Kind – We recently got one of these hand knitted dolls and she is stunning. The quality is impeccable and the mission behind the brand is unbelievable. For every doll purchased they donate 10 meals to kids in need. Its is really amazing. I will be giving Stella to Hazel this year and I am sure this is the first of many Cuddle and Kind dolls in our future. Family games – We are always looking for new age appropriate games for family game night and this one looks like tons of fun. Waterbeads – A few months ago we tried water beads for the first time and now my girls are addicted. A fun sensory activity they will be begging to do. Pretend Make up – Lucille loves makeup and I am so thankful for Little Cosmetic because it looks so real she doesn’t even mind. Princess and the Pea Mouse Playset – I don’t know if this is more for than or for me. I just think this is the cutest little set ever. Coffee set – Tea is so last year. Now its all about playing coffee shop and pretending to be your favorite Starbucks barista. Magnatiles – Fun turned educational. I will take it for my future engineers. Barbie – I live in a Barbie obsessed house. This is the newest wish for my girls ever growing Barbie collection. It is pretty darn cute. Purse – Along with makeup my Lucille goes crazy for a cute handbag. 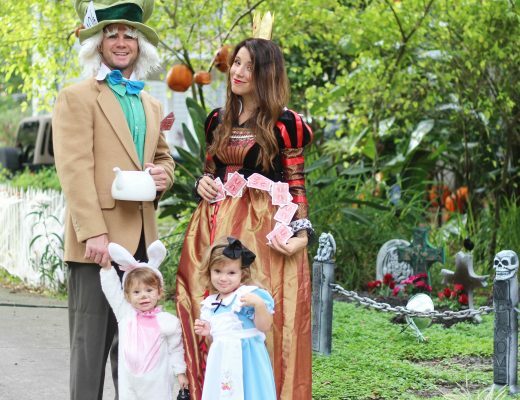 When I saw this one I about fainted because I know that Lu will do the same when she sees it on Christmas morning. Unicorn Pillow – Edith actually asked me for a real life Unicorn (emphasis on real) and we all know that can’t happen so this cute pillow for her new bed will have to do. Toy Snap Beads – This looks like so much fun and my girls will love making their own jewelry. A year of classes – My girls take a lot of classes, (ballet, gymnastics, swim) and that can get really expensive. I know gifting them something that isn’t tangible isn’t that fun on Christmas morning but we try to get them something that we can incorporate into this gift idea. For example my daughter Edith will be starting soccer this year so we found this inexpensive soccer set with goals, cones and a ball so she can practice at home. Lucille will be starting the piano so we found this fun pink keyboard and a book so she can do extra practicing. Art Supplies – I don’t know about you but we go through a ton of art supplies. We incorporate a lot of art in our homeschool day so I like to stock up on the necessities during Christmas that I know we need all year long. I love this big art case to keep all her coloring materials organized. Of course play doh is alway a must. Construction paper, glue, and paint, are fun items we always include. Tickets to attractions – we love going to the zoo, aquarium, or theme park and so why not buy the tickets as Christmas gifts. You might question if this is really a NEED gift but to our family it’s things we do any way so incorporating it into our Christmas gifting helps takes the financial strain off of us later on in the year. We really loved our visit to Orlando’s Crayola Experience earlier this year. The girls had such a blast and there were so many educational aspects that I would love to drive them over to visit again. Use coupon code: GRAYRUBY to get the cheapest ticket price available! Backpacks – these are such versatile gifts. We use them for so many things and I love that my girls can be responsible for their own things. I picked these Rainbow backpacks becuase they are a bit bigger to hold more items for our upcoming trip to North Carolina. Planetbox lunchbox – This lunchbox is amazing and I have been wanting one for years. Now that I have it we use it all the time. Its the best on the market in my opinion and we all fight to use it so this Christmas we are adding another one to our family collection. Remie Girl – If you follow me on Instagram you probably already know that I am in love with Remie Girl. I got the girls new dresses and leotards for Christmas and I can wait for them to open their gifts and start wearing these cute styles. You can even use the leotards for a “need” gift when gifting ballet or gym classes. If you want clothes that you and your girls will love than you have to get your girls a Remie Girl dress this holiday. 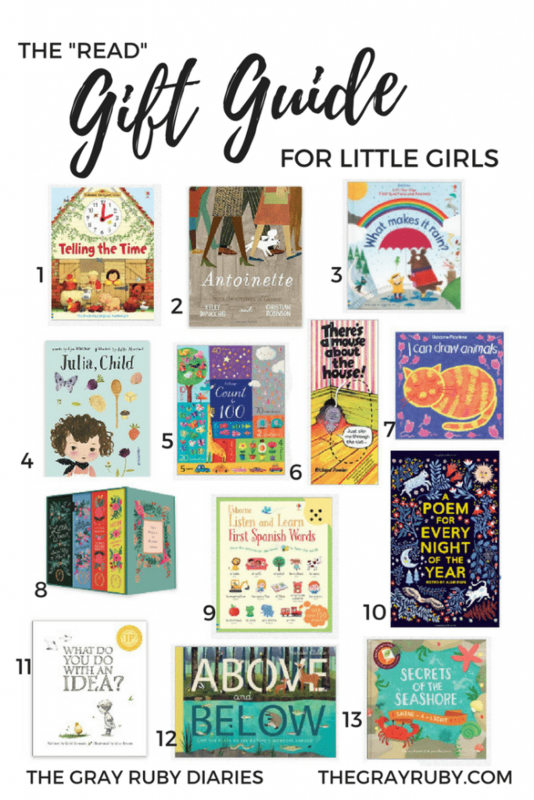 The Little Spoons – I get so many questions about Hazel’s green romper on Instagram that it was a no brainer to include Little Spoons in this years gift guide. Quality made items that make my girls feel good. Now I just need that floral skirt in my size. Tea Collection – I have always been a a huge fan of Tea Collection. They are the pieces in my girls closets that get passed down from girl to girl and still look brand new. Beautiful classic pieces that fit great and last. We recently got some long sleeve shirts for our trip up North and I love how they fit my petite little Edith. Its hard finding things that fit her properly and these shirts are long and thin with the perfect amount of stretch. Check out the slider below to see some of my favorite styles. FabKIDS – Great boots that are really inexpensive (which is what you want when your kid grows a size a month) I love the trendy styles. Rain Boots – Hazel is in a serious boot phase. Wakes up asking for her “shooos” and don’t even think of taking them off, she screams if you even try. We love these boots and have them in several colors. Primary – I love these simple pieces and I am even more in love with the quality and durability. 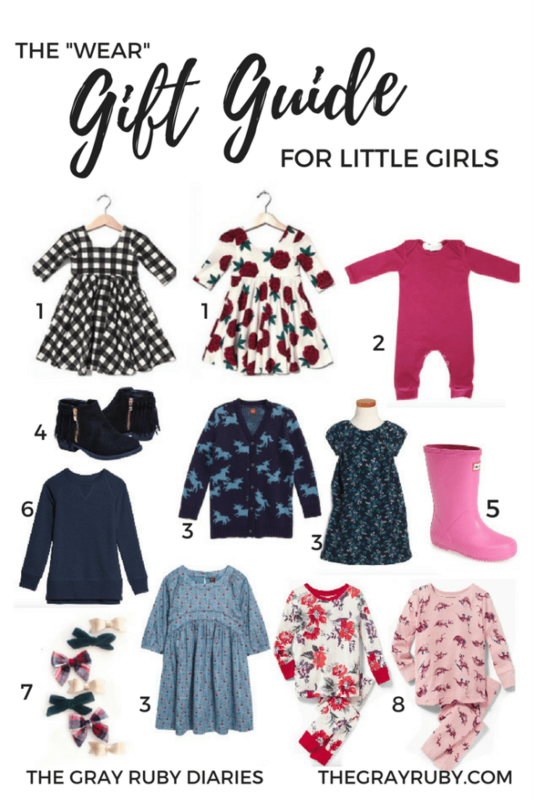 These are my go-to play dresses for my girls. Stella Bella – I am so in love with Stella Bella Bows. Its a subscription service that send three beautifully curated bows a month. Best part is that with every subscription purchased they donate bows to girls in children hospitals to brighten their day. 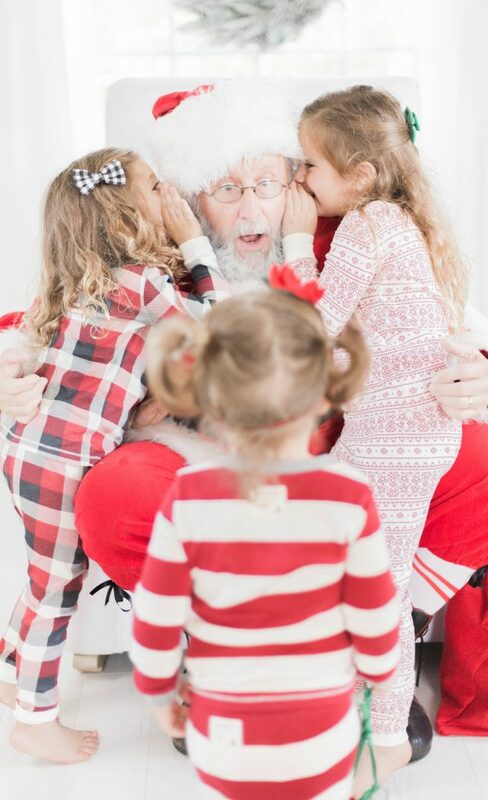 Pajamas – My girls always need new pjs, they are growing so fast and I can’t keep up. 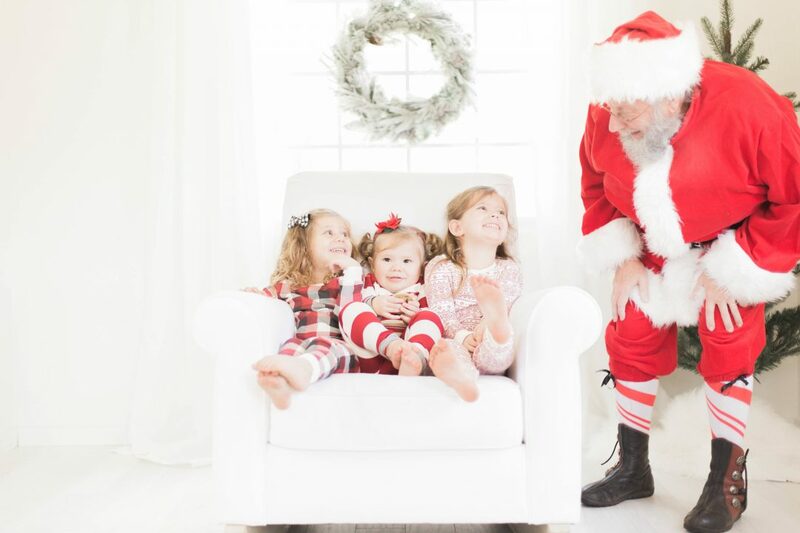 I put some of our favorites in the slider below including the pjs in the santa pictures above. Telling the Time – Another interactive book with a fun story. This book talks about a day in the life of the Boots family and as the day goes by they talk about the time. There is a small interactive clock to help them learn about time and they are able to move the little hand and big hand to match the time on each page. Antoinette – The illustrations in this book blew me away and whats better than a book with great illustrations and beautiful story. Lift The Flap, What Makes it Rain – This is the cutest non-fiction book with fun flaps and little bits of info for early learners. It should have all the answers to the questions I am sure your little one is already asking you about. Julia, Child – This is a darling autobiography with the sweetest illustrations. My girls are falling in love with cooking and this would be the perfect book for them with a little cooking set. Count to 100 – I love the thick pages of this book since I know this one will get some use from all three of my girls. Bright fun pictures for my 1 year old. Easy beginning counting for my 3 year old and skip counting for my 5 year old. There is a mouse about the house– this is a fun interactive book. The book comes with a little mouse and there are slots in each page for the mouse to go through. The mouse moves through the story and my girls are going to love pushing the mouse through the slots. I Can Draw Animals – I am going to include with the art supplies I shared above. It is perfect for my little budding artist and simple enough for those just learning to draw. Listen and Learn, Spanish Words – Now this isn’t your traditional book. This book comes with cards that fit into a flap and when you push the picture the books says the word in Spanish. My girls are going to love this and its going to be such a huge help for me as we jump into learning spanish this year. A poem for every night of the year – My girls love poetry and I love reading it. What a great way to end your day with a poem from this beautiful book. What Do You Do With An Idea – I would love this book for my little budding entrepreneurs. This book has won all kinds of awards for its unique story and encouraging message. Above and Below – Another non-fiction favorite. This book has flaps to show you “above” and “below” in different habitats. So much great info and I learn so much as I read. Secrets of the Seashore – This is a shine a light book. That means if you shine a light on the back of certain pages a secret picture will appear. This is also non-fiction with tons of great info built into a story. Lift The Flap Q&A Body – I am really trying to grow our non-fiction collection. I love finding non-fiction books that are engaging for preschoolers and these Lift The Flap series are just that. 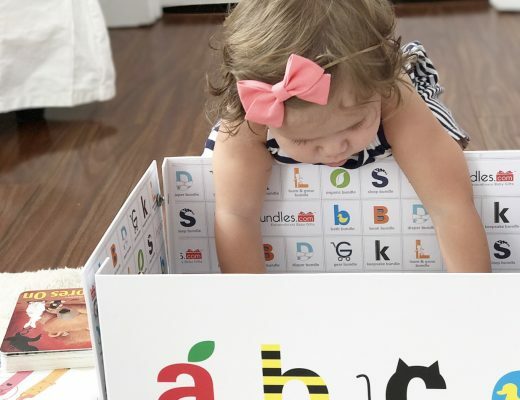 Little bits of information that is fun for kids since they get the answers to their questions by lifting the flap. Cow Takes A Bow and Other Tales – My oldest is really working on her phonics and this book is great for that. Lots of sound repetition and fun little stories. There is even a guide for the parents to help their little ones learn to read in the back. 1001 Things to Spot In the Sea – An educational version of Where Is Waldo. This book is so much information in here and the kids won’t even realize it because they will be busy searching for their favorite underwater creature. Kent Starshine Bike – you guessed it, our big gift this year (or better known as our Santa gift) will be bikes. We spent countless hours researching the best bikes for each girls age and ability and choose this unicorn themed 16” bike for Lucille and I know she is going to love it. Kent makes great quality bikes for an afforadable price and in all kinds of beautiful styles. We have actually chosen Kent bikes for everyone in our family this year, including mommy and daddy. Guys, we just love them so much. This year we want to focus more on spending quality family time and being outside and these Kent bikes are going to help us do just that. Some of the product links on this site are affiliate links. That means that if you purchase something from these links The Gray Ruby Diaries receives a commission. The Gray Ruby Diaries occasionally receives free products and payment to feature items on this site. I take a lot of pride in endorsing products I love and I hope you trust that I would never let that get in the way of sharing my favorite products with you. Thank you again for reading and hope you enjoy! Forever wishing I had a baby girl to buy these amazing things for her, so cute!! This is what my daughter does. Shouldn’t be about the presents. Not in the quantity but in the giving. Your girls are so precious! I love all the categories and ranges of gifts! Definitely going to try getting something from the 4 categories this year. I have a tendency to go overboard during Christmas. Now the girls have gifts from last year that they still haven’t opened. Thanks for the tips! This is the most amazing gift guide EVER! 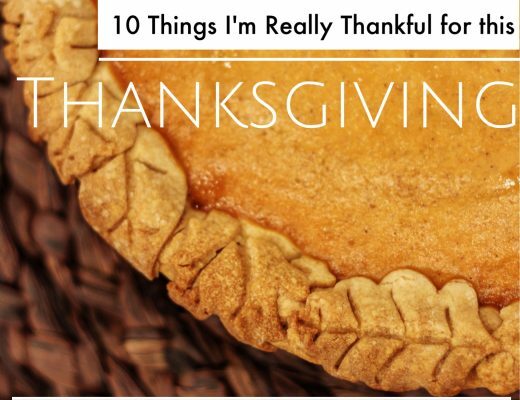 Seriously – every single one of these categories and the gift ideas included are perfect! Thank you so much for sharing! I’m definitely going to get several of these things for my niece! Happy holidays!